Thanks to the tireless efforts of Michael Brown and others, the open-source hostmot2 firmware from Mesa Electronics has been ported to the Altera SoC family and can be controlled with Machinekit running on the ARM core(s) using a Debian OS image. 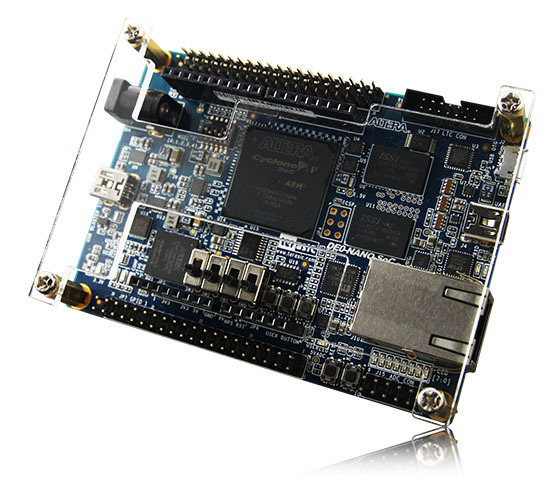 The DE0-Nano development board from Terasic was the first board supported, but the DE1-SoC and SoCKit boards also work. The hardware design files can be found in Michael's mksocfpga GitHub repo, and instructions for creating a build machine VM are available for those who do not already have an Altera Quartus development system setup. The OS is essentially stock Debian Jessie, but custom kernels, dtb files, and boot loaders are required for the various boards. Michael is working on build scripts to create full OS images, and the goal is to get builds integrated into RCN's excellent image build infrastructure, so updated images would be automatically built and released every few weeks. If you want to start testing with any of the SoC platforms, subscribe to the Machinekit issues tracker, and ask any questions on the Machinekit Google group.